What do you think of biostatistics? I think it tells us that we are not unique and we are all part of statistics. Results of useful research studies can give us an opportunity to be proactive and prevent diseases that some of us may get eventually. So, I decided to dedicate my next posts to Osteoporosis, because sadly a few friends of mine have been diagnosed with it recently. Osteoporosis translates from Greek as ‘porous bones’, or ‘bones with holes’. Osteoporosis can occur in anyone, but it is most common in older women. Small and thin women get it more often. Also, white and Asian women are at a highest risk, whereas black and Hispanic women have a lower risk. Family history can play a role too. Exercising is one of the approaches to prevent Osteoporosis. And of course, nutrition is the main one. Healthy diet with lots of products containing calcium and a sunshine will give you a good chance to improve our national statistics. Recommended daily calcium intake is above 1000mg. Read more about calcium on this Australian website dedicated to Osteoporosis. It also has a simple information on vitamin D. Apparently it is enough to be on a sun for 10 minutes per day during summer and 30 minutes during winter for a healthy vitamin D intake. That means only a short walk during your lunch time will reduce the risk! Spinach is a store house for many nutrients, vitamins, minerals, and folates. Spinach leaves are an excellent source of vitamin K. Only 100 g of fresh greens provides 402% of daily vitamin-K requirements. Vitamin K plays a vital role in strengthening the bone mass by promoting bone building activity. 1. Start a few hours before serving time. Defrost the spinach in a fine sieve, let the liquid drain. But don’t press. 2. Prepare quiche baking form by spraying with oil and dusting with rice flour. Rotate the dish then shake to make an even layer of rice flour on the bottom of the dish. 3. Combine the mixture with all other ingredients except the topping ingredients. 4. 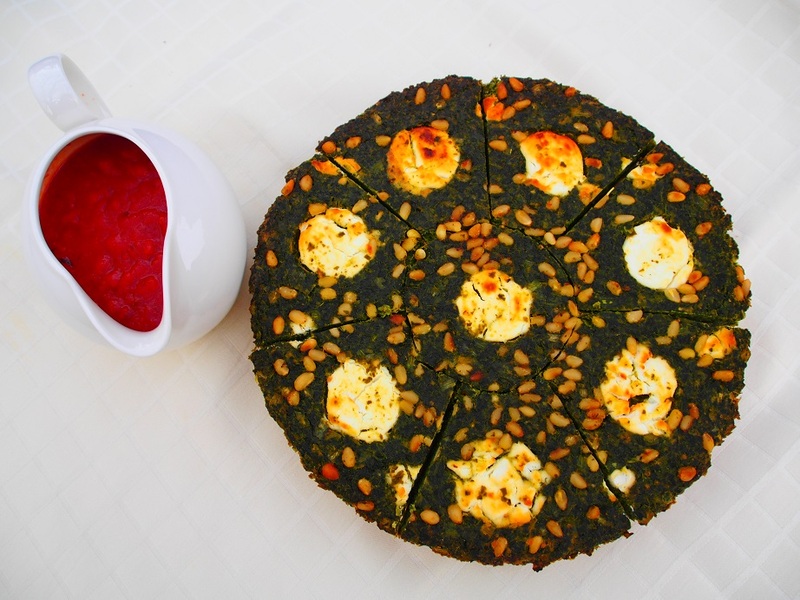 Transfer the mixture into the prepared form, make the surface flat, lay out the cheese wheels, sprinkle with pine nuts and press them lightly into the tart but leave them visible. 5. Bake for 30 minutes at 180c fan forced oven. Total: 1420 k calories. Per serve: 142 k calories. ← Almond Raspberry Flourless Recipe.